Flash forward to spring 2014: You are strapped in a seat and slowly lifted up at a relaxing pace. The cool breeze tussles your hair and birds are soaring around you. Your final destination will be at 310 feet high with a wonderful view of Tampa, Florida…hope you aren’t afraid of heights! But then your view will change; your seat will tilt forward 90-degrees. Ever imagined you were a bird soaring? That will be the sensation of this thrill ride, except at a standstill. Are you scared yet? Is your heart pounding? Are you screaming? 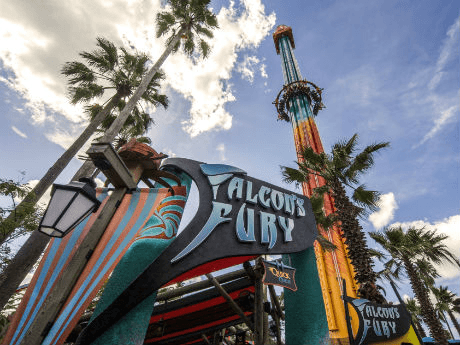 Falcons Fury will be randomly timed so you won’t know when you will be dropped, but we promise you will and it will be at an exhilarating 3.5Gs! Just thinking about it makes our heart race and our hands clammy, and we’re adrenaline junkies! Falcons Fury is anticipated to open in Spring 2014 at Busch Gardens Tampa. It’s surprising that there hasn’t been this type of a thrill ride before. At BigRentz, our heavy equipment rentals may not give you the same heart-pounding experience, but if you plan to construct another ride that is even more terrifying, don’t forget to give us a call for your rental needs! It is easy, just pick up your phone and call us at (888) 325-5172.